Sometimes the most original and creative things are devised because of, and not despite, limitations. These constraints can be practical, like using old clothes or flour sacks to create beautiful quilts, but sometimes they are self-imposed. Think of Piet Mondrian and the De Stijl movement using only primary colors and simple shapes or Henri Matisse creating masterpieces using just scissors and colored paper. 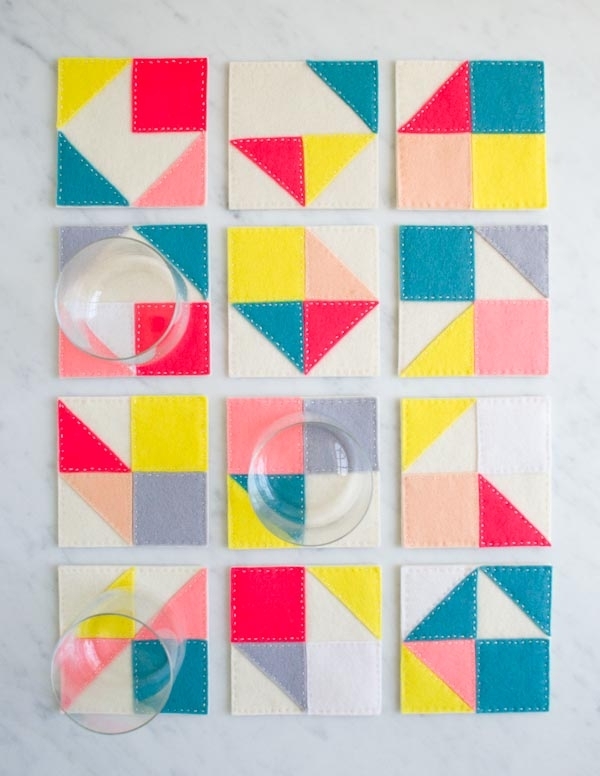 These Modular Felt Coasters work within the limitations of a grid using only 2-inch squares and right triangles, but the process of creating these coasters is pure invention, much more like play than work! I love how each coaster evolves into its own little treasure, amazingly different from the others despite the similarity of their components. In addition to being super fun to make, these Modular Felt Coasters are also super simple. Just cut and hand stitch! No machine required, so tuck a Felt Bundle into your carry on or weekend tote. 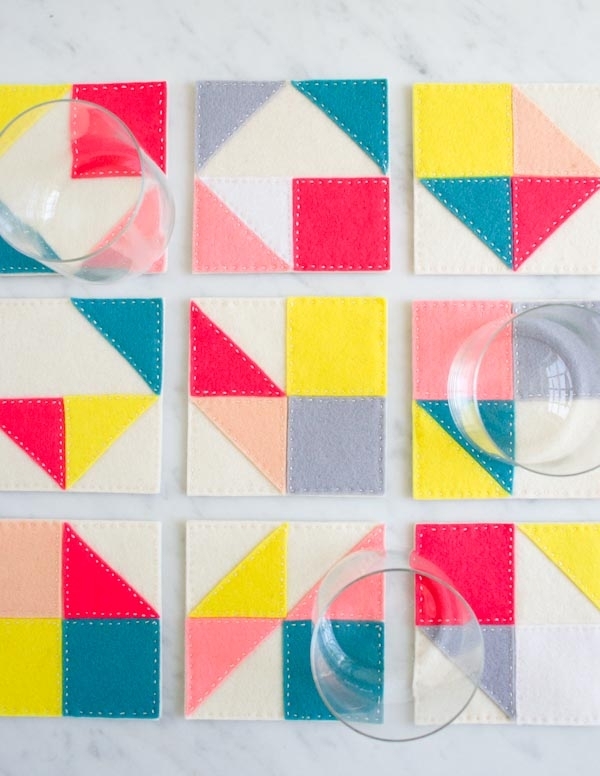 And when you’re done, slip your new coasters under some tall, beachy drinks! 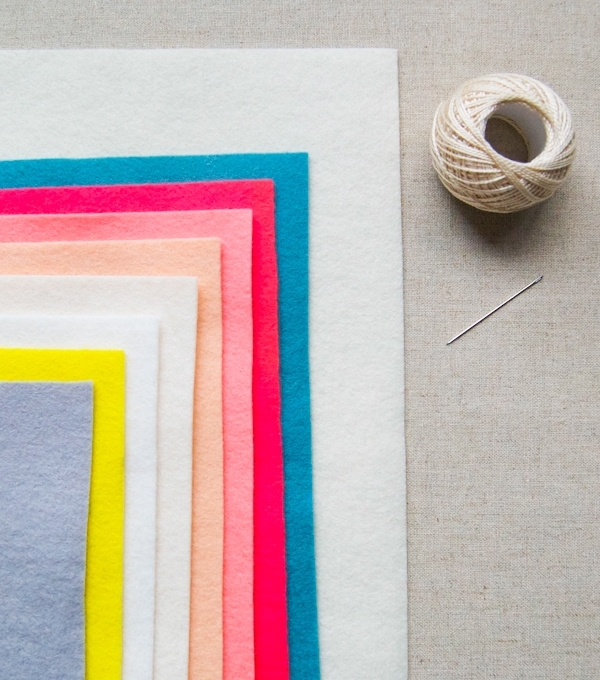 One Purl Soho Felt Bundle, 100% wool. I used the Mariposa Bundle. One ball of DMC’s Pearl Cotton in a coordinating color. I used color 712. You will also need straight pins and an embroidery needle. These materials will make 10 coasters. If you’d like to make more, you should know that you will get eight coaster backings from an 18 x 18-inch Precut piece and 2 coasters backings from a Bundle piece. 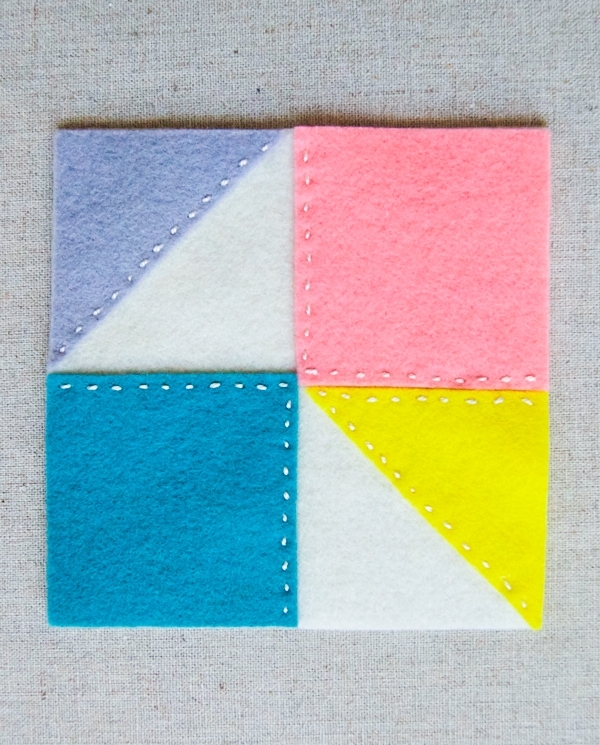 You will be able to embellish at least 20 coasters from all the colored felt. From the 18 x18-inch square piece and the smaller piece of the same color from the Bundle cut twenty 4-inch squares. These are the Backing Pieces. From each piece of the other colors in the Bundle cut two 2 X 8-inch strips. From these strips cut eight 2-inch squares. 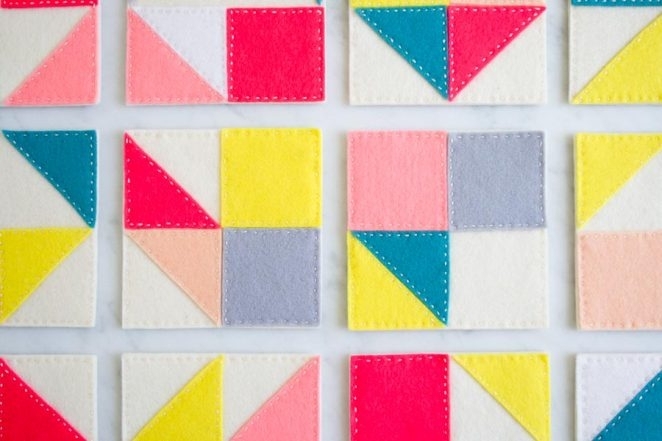 Cut three of these squares in half diagonally to create six 2-inch right triangles. These are all the Modular Pieces. Now comes the fun part! 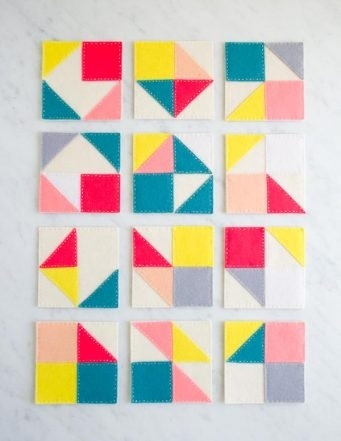 Arrange several Modular Pieces on a Square Piece in a pleasing layout. Pin the pieces into place. 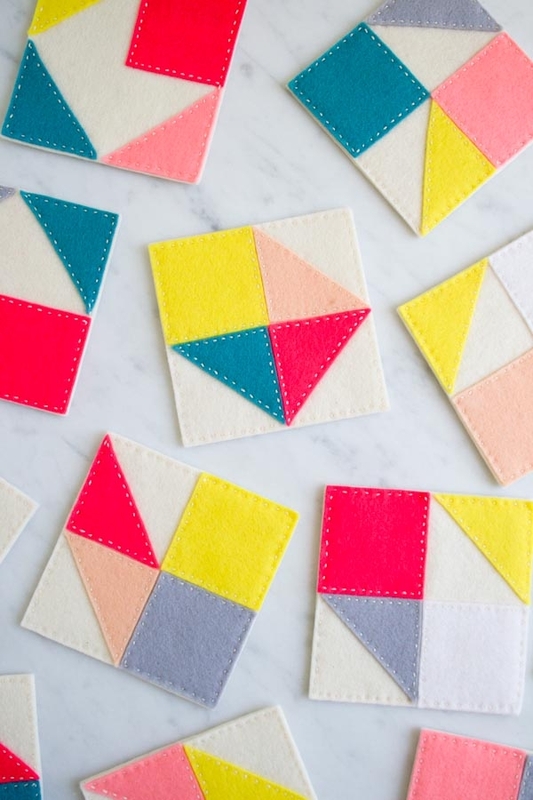 Sew all of the inside sides of the Modular Pieces down with a small running stitch, hiding the beginning and ending knots at the back of the Square Piece. This is the coaster’s Top. 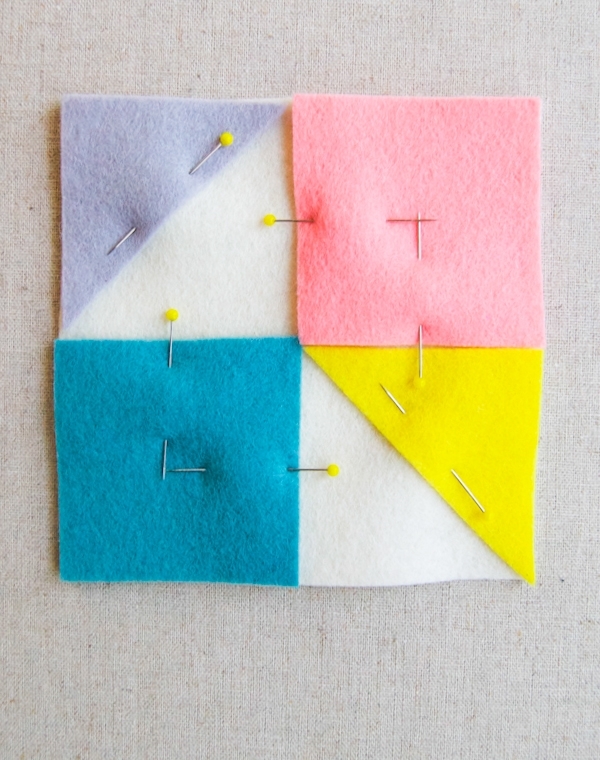 Pin a second Square Piece to the back of the Top around all four sides. 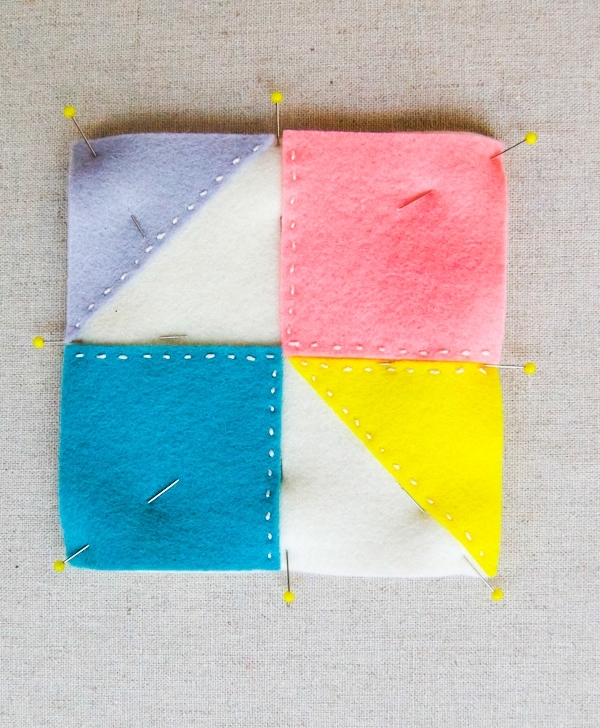 Cut a 24-inch length of thread and tie a knot at the end and then, entering in between the two Square layers of felt, stitch all of the layers of the coaster together with a small running stitch. When you have gone all the way around, pull the needle out at the back of the coaster and tie a French Knot (link) at the exit point. Pull the needle through just the back layer, exiting about an inch away. Snip the thread at the exit point to hide the end. Repeat for the remaining Pieces and you’re all done! Oh I LOVE these. The colors are unexpected and wonderful . The shapes are perfect. I think I'll make some for hostess gifts. They're wonderful! Congratulations on doing such a great job! These are stunning! One question though, drinks can often leave a ring mark on a coaster. How are these to wash? You might want to spray them with a stain resister before using them and you can also handwash and dry them occasionally. These are adorable! Just wondering. 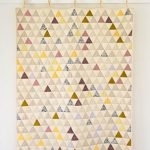 Do you completely cover the tops with all the squares/triangles? Or only a few? I can't tell from the pictures. If not, does the coaster seem uneven? these are so cheerful and sweet. 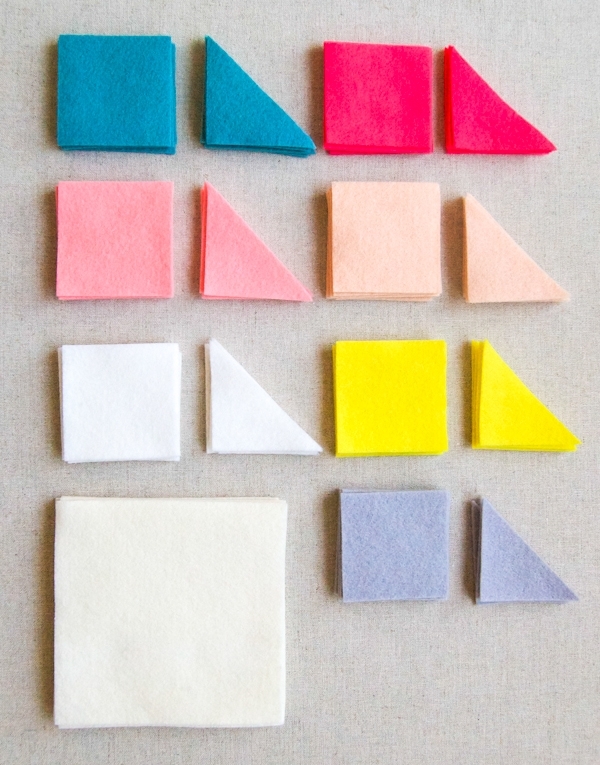 quick question: i was looking at the different bundles but couldn't see the actual names of colors in each bundle to be able to match them to the name/number of the individual sheets (in the case of your example, the ecru). am i just missing it? i was looking at maybe the dark purple in peony. The tops are not entirely covered so they are ever so slightly uneven. But it's not enough to put your drink in jeopardy! But if you are really worried you could certainly cover the entire top! Please let me know if you need any more help with this. You can also email customerservice AT purlsoho DOT com and they can help you directly! These are wonderful! 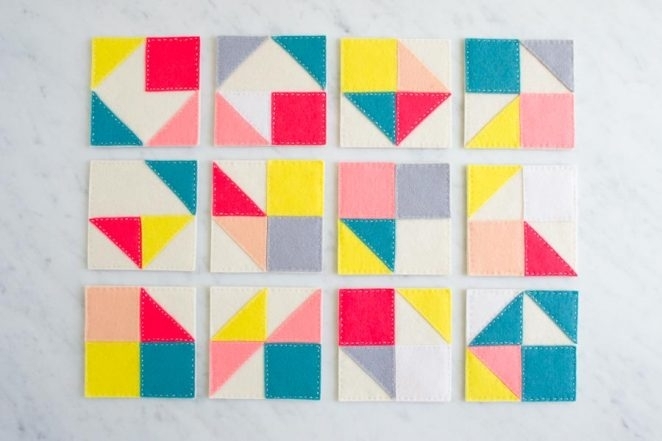 I am going to purchase the Confetti wool bundle – can you list the colors for me so I can purchase the 18 x 18 piece in a coordinating color. Also, what DMC’s Pearl Cotton color would you recommend for that bundle? Thanks for your help! I would use the same ecru colored DMC with these colors. Thanks so much for getting in touch about this and good luck with the project! 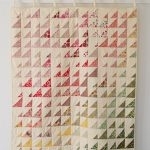 This has “quilt” written all over it! It’s very funny that you mention this because we have something like this in the works… please stay tuned! What would you think about doing these on a machine, good idea or not? And if so, what adjustments would you make? On a separate note, I’ve made a number of your projects over time, and I’d love to post my pictures. I see you have an Instagram account, but they don’t seem to be broken down into individual boards by project. I’m not an Instagram user, so maybe I’m just missing something? Or is there somewhere else to post (and look at pictures) by project? 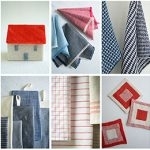 You can make these on a machine with no real adjustments, just sew slowly and carefully. We would love to see your pictures. You can add a hashtag of #purlsoho or #purlbee to your Instagram photos and we’ll see them. Or post them on our Facebook page. For knitting projects you can also look at photos by project on Ravelry: http://www.ravelry.com/designers/purl-soho . Unfortunately there isn’t a forum like that for sewing projects. I hope this helps! Love these! Am curious as to how well these would work with drinks containing ice….I mean when the glasses sweat. Wonder if it would help to use a thin piece of cork between the two pieces of felt. These work surprisingly well with sweaty glasses, no need to adjust the pattern at all! Wool is naturally a bit water repellant. Thank you for your question and please let us know if you have any more! Can you tell me the colors in the Lichen bundle? 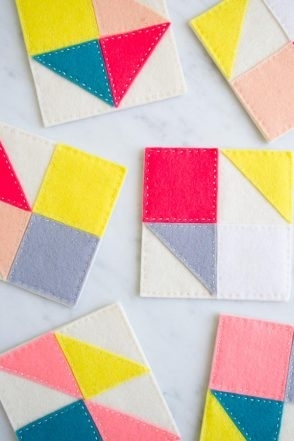 In order to order a backing color I want to make sure I match one of those and there are several similar looking colors – thanks! Can’t wait to try this out! These are too cute! Just pinned them to my Pinterest. I’m starting quick and easy craft classes at my place of worship and thought these would be awesome for that. Thanks for sharing. SO. CUTE. These would make really great birthday gifts or Christmas gifts. 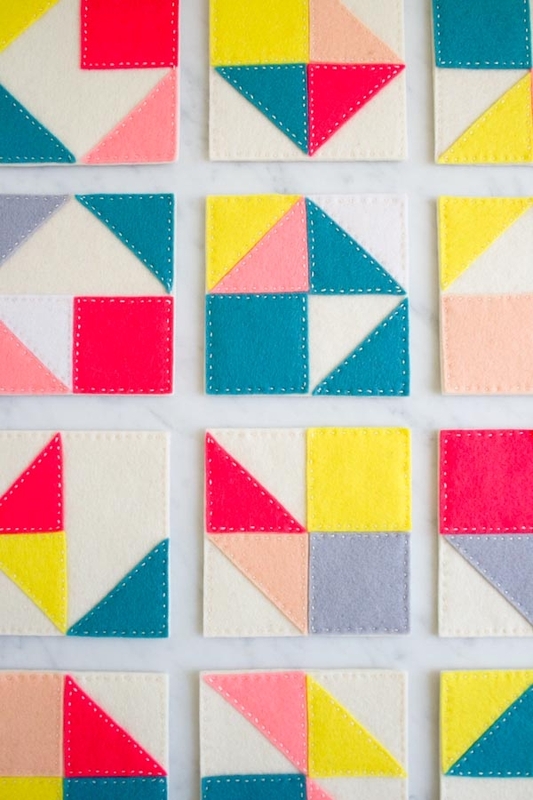 I love the bright colors and beautiful geometry! You should put some of your fun ideas in the DIY contest over here: http://www.birthdaybullseye.com/diy-birthday-gifts.html I’ll bet you have a bunch more amazing ideas. Thanks for sharing this! Hi. Can you please let me know the colors in the Winterberry bundle? I think these are very pretty. I don’t know anyone who has the time to hand-stitch these so “for Pete’s Sake!” just whip them up on the machine! Thank you for your kind words! You can certainly whip these up on a machine. If you decide to do so we recommend going slowly and carefully. Thank you for writing in and please let us know if you have any questions. 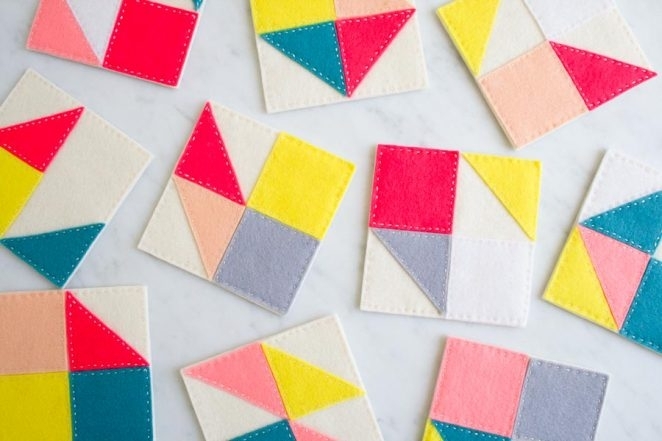 Yes, you can sew them on a machine. But their charm lies in the hand sewing. 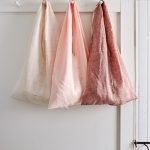 Purl Soho always has the best craft ideas. Many are quite simple, but very beautiful because of the elegant and artless design. These would be a sweet accent in our mod living room but I am not a sewer so your instruction to enter in between the two layers of felt and sew a running stitch doesn’t really make sense to me. Am I doing this only to secure and hide the knot or am I going between the two layers with each stitch? Is there a vid anywhere? I’ve just subscribed to your post and love it. 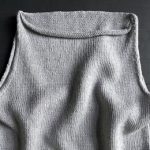 I’m a knitter and your items/patterns/yarn are gorgeous! 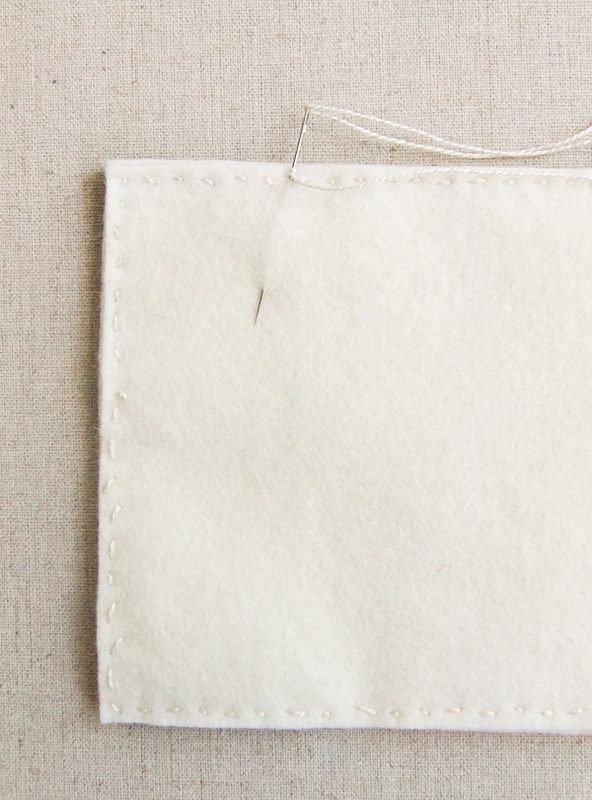 For sewing the coasters, you will be hiding the knot between the two layers, then sewing the two layers as a whole with each stitch. Yup; Melissa, that clears it up nicely! I’m excited to make these as a gift, I’ve been waiting for the right moment! I think I am going with the Lusterware felt bundle…which background felt and embroidery thread color do you recommend for this bundle? Thanks for your assistance! Thanks for reaching out. We think Salmon 69 would be a great background color for the coasters! In regards to thread, a fun contrast would be B5200, or more matchy would be 606.